EUR has been massively empowered by the Dovish Fed Stance. Eurozones’ economic data today will most probably support this growth as well. Traders will be waiting for Sino-U.S. Trade Talk. 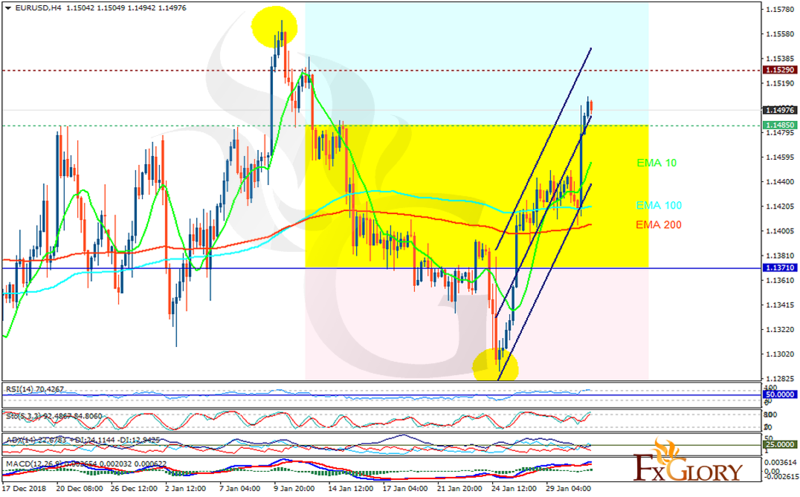 The support rests at 1.14850 with resistance at 1.15290 which both lines are above the weekly pivot point at 1.13710. The EMA of 10 is moving with bullish bias in the ascendant channel and it is above the EMA 100 and the EMA of 200. The RSI is moving in overbought area and the Stochastic is showing upward momentum. The MACD line is above the signal line in the positive territory. The ADX is showing buy signal. EURUSD may continue its bullish trend towards the previous high at 1.157.